The Cabin Crew of SriLankan Airlines will commence industrial action today in protest over the management’s non acceptance of their Flight Attendants Union Executive Committee Members’ legitimacy. An emergency meeting was called for by Cabin Manager Adrian Cramer which was also presided over by Cabin Manager Dion Jansz that was attended by over 200 Cabin Crew at the Bandaranaike International Conference Hall in Colombo yesterday. 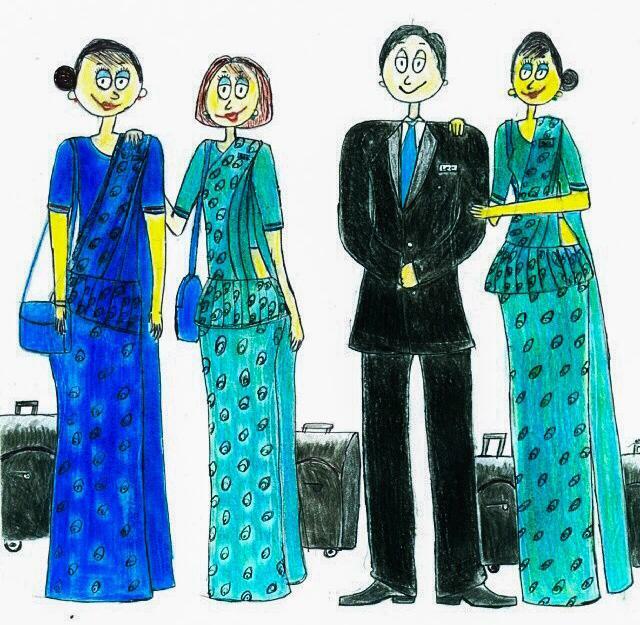 This emergency meeting was held after the management of Sri Lankan Airlines wrote officially to Cabin Manager Adrian Cramer and indicated that they refused to accept a group of Cabin Crew headed by him as the official body of the Flight Attendants Union (FAU), as they neglected to furnish proof of their official capacity despite being written to officially. In a series of articles commencing January 2016, It was factually reported by Colombo Telegraph that the group of cabin crew masquerading as members of the Executive Committee of the FAU were in fact in violation of their very own constitution. This was when Cabin Manager Cramer along with a group of Cabin Crew forcibly took over the reins of the FAU in December 2015, even though they did not hold a ballot which was constitutionally required. At the meeting today a motion was passed to commence immediate industrial action where by the Cabin Crew will refuse to fly on their days off. It was also passed to cut down on the In Flight product offered to passengers depending on the number of available Cabin Crew on board. This industrial action will continue until the management of the airline agrees to accept them as the official FAU body and commences engaging in dialog with them. Over the years the management of the national carrier has always operated with numbers way below their required cadre of Cabin Crew and has juggled around with their off days to ensure that flights were properly crewed. A Cabin Crew Member who attended the meeting speaking to Colombo Telegraph on condition of anonymity, as staff of the airline is barred from speaking to the media said “The meeting started off with Cabin Managers Cramer and Jansz assuring those present that the current body of the FAU Executive Committee Members were a legitimate group according to their consulted lawyer Chrishmal Warnasuriya. Cramer and Jansz also went on to highlight the incompetence of both the Chairman Ajit Dias, who they said has no prior airline experience and the CEO Capt. Suren Ratwatte who equally has no management experience to hold such a post. Even the current Head of Flight Operations Capt. Rajind Ranatunga was verbally shredded. Further another motion was passed to hire the services of a private investigator and find out who is responsible from within to have colluded with the airline’s management and also to seek the culprits who frequently leak out information to Colombo Telegraph”. A senior manager of the airline also speaking on condition of anonymity said “These guys are simply crazy but more ungrateful I must say. Firstly they beg for jobs at the interview stage when they choose to join. They promise the sun, moon and stars and also say that they will do any flight, anytime and that they will even scrub the floors of the toilets on board if they are given the job. A few years down the road and they have forgotten all these promises they made and now wish to hold the airline to ransom. They are currently paid much more than most qualified professionals within the airline and a majority of them are paid over half a million rupees a month as wages, even though most don’t even hold a basic degree. They are utterly stupid the way they are behaving now especially due to the hardships we as an airline are currently facing. We will shortly be over staffed with Cabin Crew when our flights to Paris and Frankfurt stop soon. Only then they will understand the value of the jobs. At the rate they are behaving they will certainly help the airline with closing down those European stations sooner than planned. This may be a blessing in disguise. Also the Cabin Crew will have no more flight stop overs in Dubai, Abu Dhabi, Doha and Kunming as they are all going to be round trips for them. As the management of the airline we certainly do have a backup plan to counter these sorts of threats put forward by the Cabin Crew. Rest assured we will not let our valued passengers suffer in any way due to these threats”. The last time the FAU went on industrial action was in 2004 under the then Cabin Manager and President Primal De Silva. This was when the national carrier was run in a ten year partnership with the Dubai based carrier Emirates Airline. One of the primary reasons for that strike was when the FAU wanted the Emirates Airline employee and Head of Service Delivery Walter Riggans out. It was alleged that the strike was part of a concocted effort pulled off by De Silva and his union members on the instructions of the then Chairman Peter Hill, whose job as the Head of Sri Lankan Airlines was being threatened by Riggans. The FAU won that battle, Riggans was sent packing back to Dubai, whilst Hill continued his term until the contract with Emirates Airline terminated. FAU President Primal De Silva was rewarded for his effort and was promoted to the post of Safety Manager, even though he never conducted a single safety class in his career up until that point. His subsequent rise from then sees him currently holding the post of General Manager of the airline’s International Aviation Academy.